Louise Marie Thérèse d’Artois lived a life marked by murder, revolution and exile. Born a French princess of the Bourbon line, Louise spent the majority of her years separated from France. When she finally obtained, through marriage, a kingdom in the form of the Duchy of Parma, it was torn from her by war. The little girl twirling across the grass at the Palace of Saint-Cloud in Napoleon in America, Louise Marie Thérèse d’Artois, was born on September 21, 1819 at the Élysée Palace in Paris. She was the oldest living child of Charles Ferdinand, Duke of Berry, and Maria Carolina, daughter of the King of the Two Sicilies. Two older siblings had died shortly after birth. Her great-uncle, Louis XVIII (after whom she was named), was king of France and her grandfather, the Count of Artois, was heir to the French throne. Had Louise been a boy, she would have been in line for the crown herself. This project became unnecessary upon the birth of Louise’s younger brother Henri in September 1820. In the meantime, Louise’s father had been murdered – stabbed in February by a fanatical anti-monarchist outside the Paris Opera. 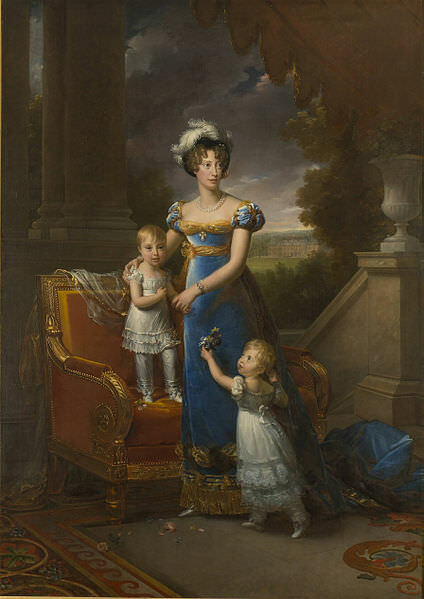 The Duchess of Berry was not the most attentive mother, so Louise spent a lot of time with her childless aunt, Marie-Thérèse, the Duchess of Angoulême. The two were devoted to each other. Known popularly as “Mademoiselle,” Louise – like her brother – was the subject of charming anecdotes and the instigator of numerous good works, intended to endear her to the people of France. In 1827, Louise – with her aunt – laid the cornerstone of the church of Saint-Jean-Baptiste de Grenelle in Paris, resulting in the naming of a street (rue Mademoiselle) after her. In 1829, she joined her mother in a visit to Dieppe. 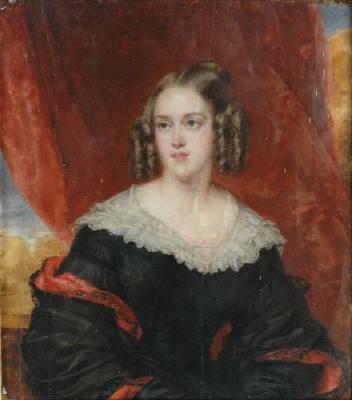 Louise Marie Thérèse d’Artois never returned to Dieppe. As described in my post about Henri, the royal family went into exile after the 1830 July Revolution in Paris. Chateaubriand was charmed by 13-year-old Louise when he visited the Bourbons in Prague in 1833. On November 10, 1845 at Schloss Frohsdorf, near Vienna, Louise married her cousin Ferdinando Carlo, the hereditary Prince of Lucca, four years her junior. The groom was not keen on the idea, but his father – who had an eye on Louise’s substantial dowry – threatened to cut off his allowance if he didn’t go through with the wedding. Louise and Ferdinando Carlo wound up getting along with each other and had four children: Margherita (b. 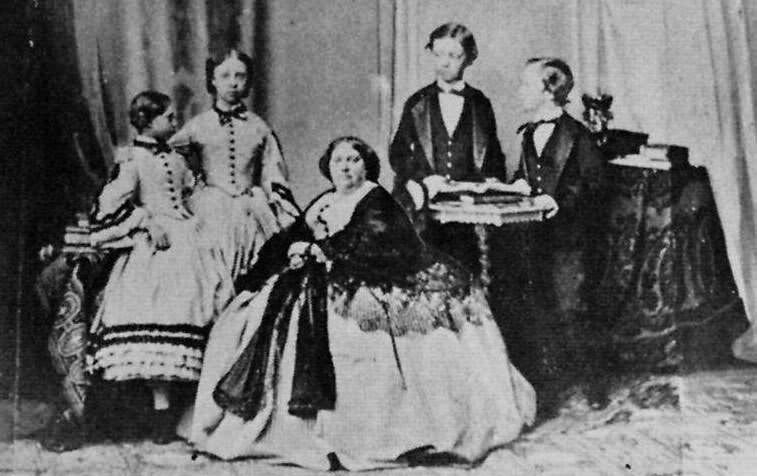 1847), Roberto (1848), Alicia (1849) and Enrico (1851). In 1847, when Napoleon’s wife Marie Louise died, her hold on the Duchy of Parma (which she had been granted by the Congress of Vienna) ended and the Duchy reverted to its previous rulers, the Bourbon-Parma line. After a brief exile in England in 1848-49, owing to a revolution in Parma, followed by the abdication of Ferdinando Carlo’s father, Ferdinando Carlo and Louise became the Duke and Duchess of Parma. But Roberto did not get the chance. Louise was again compelled to leave Parma. She and the children moved to Venice, under Austrian protection. Any hope of regaining their kingdom disappeared the following year, when all of central Italy was annexed by Piedmont. Louise Marie Thérèse d’Artois died of typhus fever on February 1, 1864 at the age of 44 in the Palazzo Giustinian in Venice. Her brother Henri was with her. She was buried in the Bourbon crypt of the Church of the Annunciation of Mary, in the Kostanjevica (Castagnevizza) Monastery in Nova Gorica, Slovenia. Louise has many descendants. For starters, her son Robert had 24 children, including Zita, the last Empress of Austria-Hungary. Arthur Léon Imbert de Saint-Amand, The Duchess of Berry and the Court of Louis XVIII, translated by Elizabeth Gilbert Martin (New York, 1898), p. 128. Arthur Léon Imbert de Saint-Amand, The Duchess of Berry and the Court of Charles X, translated by Elizabeth Gilbert Martin (New York, 1892), p. 4. François-René de Chateaubriand, Mémoires d’outre-tombe, New Edition, Vol. VI (Paris, 1910), p. 79. Constantine Henry Phipps, Marquis of Normanby, An Historical Sketch of Louise de Bourbon, Duchess-Regent of Parma (London, 1861), pp. 10-11. Today the palace in Duchy of Parma is a museum, dedicated to Napoleon’s widow Marie Louise. She spent her time doing elaborate needlework on sophisticated embroidering machinery. Thanks, John. I’d like to visit that someday. Wonderful piece! Her life is a microcosm of European history in the early 19th century. Thank you, Caroline. I’m glad you enjoyed the article. It is interesting that Louise’s relatively short life encompassed so much, and that she left such a large dynasty. Thanks, Greg. Your article is interesting. Her whole person is a mixture of child, girl and princess: she looks, lowers her eyes, smiles with a naïve coquetry mixed with art; one doesn’t know whether to tell her fairy tales, declare oneself to her, or speak to her with the respect due a queen.